by our new chimney, with care! And cheering! And lots of exclamation points! 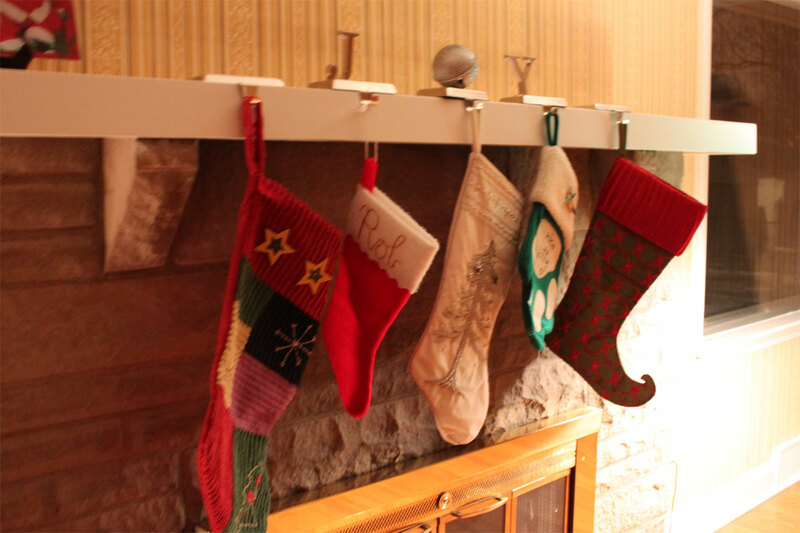 We got access to the new house today and rushed over to take care of first things first, like hanging our stockings. I think we all feel better now. In addition to our stockings we took over some fragile items (lamps) and some that would be overly difficult to pack, like my stand mixer. It sure gives me a mental boost to know that my stockings and my stand mixer are waiting for me over at the new house! Our stockings each have a bit of a story. Mine (first) was a gift from Rob during the Christmas of our engagement. Rob’s is from his childhood. Dorothy’s (ivory with the silver tree) has eighteen silver hooks sewn on it. Each Christmas Santa brings her a sterling silver charm representing something special about her year, and he hangs it on a hook on the stocking. By her eighteenth Christmas she will have a nice collection of meaningful charms that she can choose to leave on her stocking, or put on a bracelet if she wishes. I like this tradition because it takes up less space than ornaments, and can double as something functional (wearable jewelry) instead of just (pardon me) a box load of crap that she feels like she has to keep until one of us dies. Not to be all anti-sentimental, but I just am not in favor of traditions that burden people with lots of stuff they must store. The cat’s stocking is next, and then Worth’s. I had a hard time thinking of how to adapt the charm tradition for him, but I did come up with something. His stocking has big circles on it, and eighteen of them are well-centered on the stocking. Santa has purchased a good supply of silver letter beads and will string one word in the center of a circle each year. It’s not wearable, but at least it will never take up more room than a stocking. 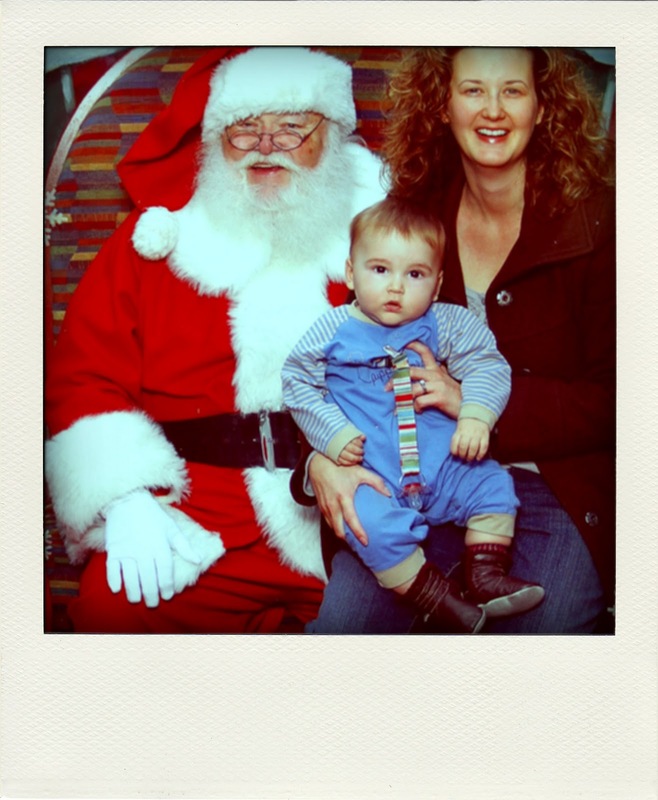 Santa still hasn’t decided what word will sum up Worth’s first year, though–for some reason “victuals” keeps coming to mind, as that boy is such a big fan of his dinner! And the packing continues. 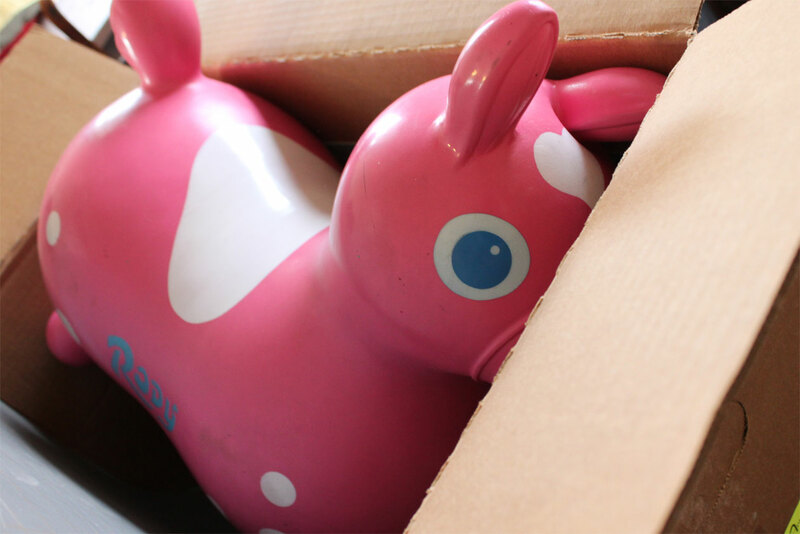 Poor Rody Pony, getting squashed into a box! We were sure we’d have the keys to the new place by now but we don’t. There was a problem on the seller’s end with one of the repairs we requested taking longer than expected. I’m trying not to feel excessively frustrated about it, but it is frustrating to have thought we’d have access to the house by now but not. My plans to move everyday items (like most of the kitchen and closets) by tote and unpack them directly into their new spots have fallen through, so now we need many more boxes, much more packing paper and a lot more takeout than we’d thought. Still, I’m trying to focus on the merry Christmas we’re going to have around our new hearth, and being glad our conscientious seller is taking care of everything at the new house. I’m thankful for the Vietnam Kitchen down the street and for disposable diapers for one week only! Most of the sweet baby booties I made when I was pregnant are no longer in use at my house. 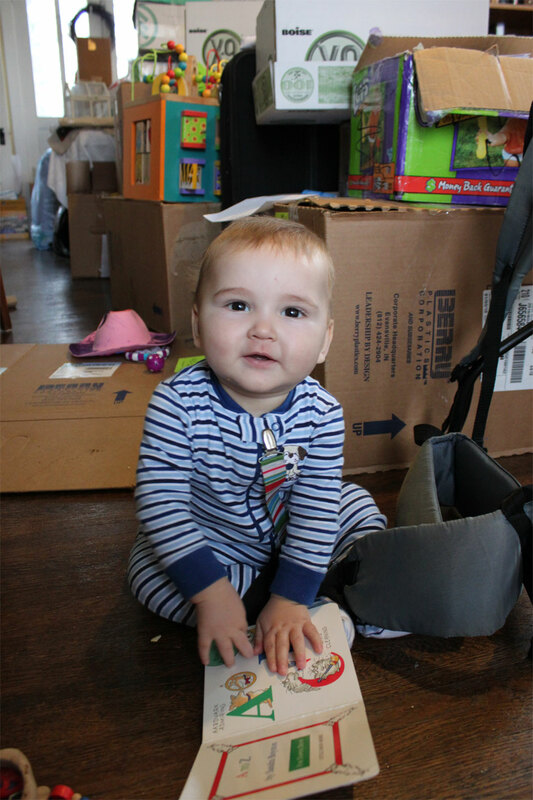 Now that Worth can pull himself up he needs grippy-footed soft-soled shoes to keep him from skidding all over our hardwood floors. This one pair does still work, though. Since I’d made this pair to fit a bigger baby, I’d had the foresight to also do something about the slipping issue. It doesn’t work perfectly well, but really neither do leather soles, and it’s too cold for bare feet. 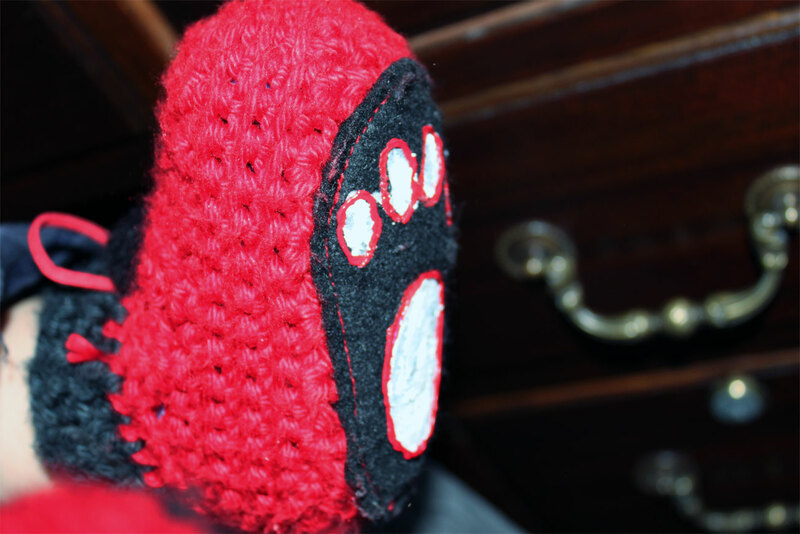 I sewed a felt sole onto the bottom of these booties, then used rubbery puffy fabric paint to paint little paw prints on the bottoms. The paint provides some traction on the floors and keeps Mr. Baby from whacking his head for any reason not related to his own nascent motor skills. These booties stay on with the help of red leather cord laces and are very cutely U of L-y, but unfortunately I did not think to put them on him when he made his first trip to the new stadium last week to see his first basketball game! The real estate project is progressing nicely. We’ve taken care of our buyer’s inspection repair quests and our seller has responded positively to ours. We’re hoping for a Merry Early Christmas closing in about two weeks. In the meantime, *I think* (and I almost hate to jinx this by even blogging about it!) that our buyers are going to allow us to have a key very soon to start moving in some of our things. I’m so excited! I couldn’t resist popping in on Early Bird Thursday today at my favorite thrift shop to see if I could score some goodies for our new digs, and I totally did! 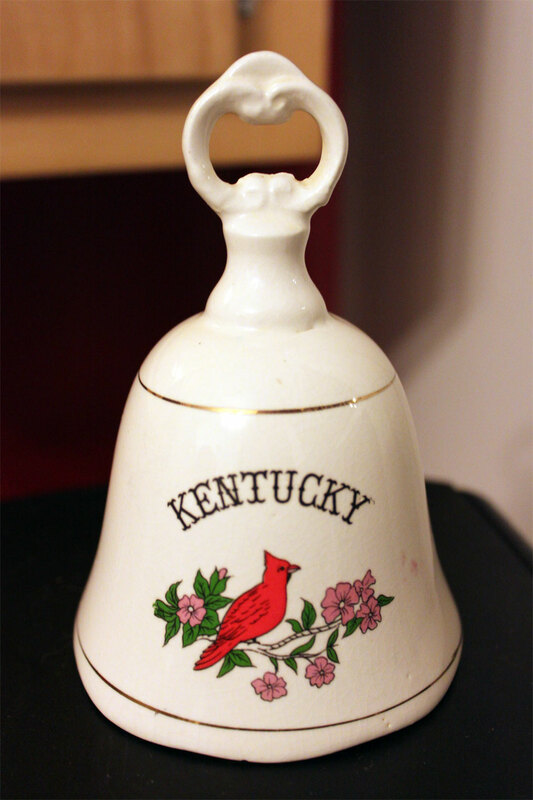 A yellow bed skirt for Dorothy’s new room, a little knick-knack shelf for our crafty studio, a vintage Christmas tablecloth, a rug for our studio, a mirror to hang over our dress-up box, and this little bell for my vintage Kentucky kitchen. $18 well spent, in my opinion. Looking ahead, I think Dorothy must have an owl pillow similar to these in her new vintage-floral bedroom. I’m pretty sure there is a sheet in that pile just crying out to be an owl pillow. How cute are they? A few weeks ago I was trying to figure out something nice to do with a particularly cute caterpillar drawing of Dorothy’s and this is what I ended up with. It’s a custom t-shirt from Cafe Press that we will give to Dorothy’s cousin for Christmas. I hope it isn’t too redundant with the joint venture Dorothy and I made for the same cousin last winter, but since that gift was appreciated, this gift in the same vein probably will be too. Dorothy really enjoys feeling like she contributed to the making of any gift, and the benefit of a professionally done t-shirt is that it should wash nicely, unlike (unfortunately) the print-at-home transfers, which require fussy care to stay nice. 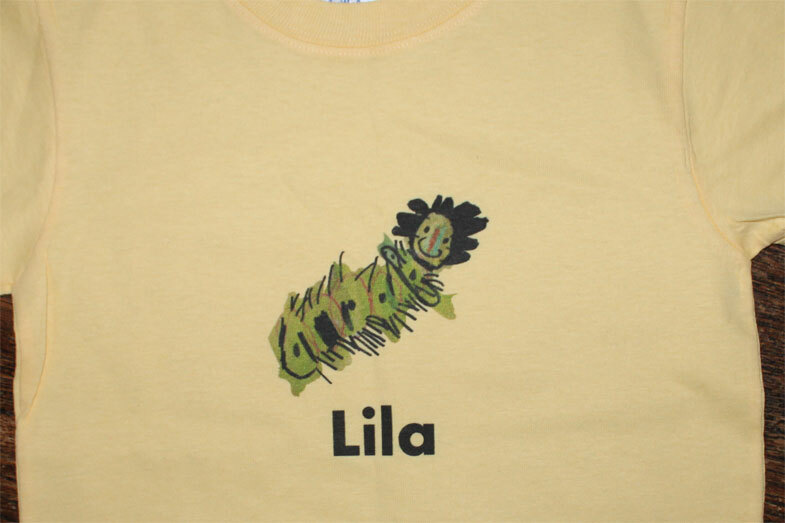 I removed the white space from the caterpillar image using Photoshop, then saved the file as a PNG with a transparent background to make the design. I took advantage of the warm weather this morning and did some more camper painting. I still have not had the chance to finish what I started with the handkerchief paisleys, but this morning I made solid progress on the opposite side. I purchased new, good quality brushes and they make all the difference in the world. Maybe I should have thought of that before, but the difference was really amazing. It was like I was trying to chop vegetables with a kiddie knife before! This time the paint went on much better and the lines look more smooth. It was faster going, too, so if I get another golden moment while both children are asleep or occupied and the weather is right I will get back out there. Otherwise, the camper may have to stay incompletely decorated until the spring. As for our housing situation, who knows. We’re working on a response to a set of nit-picky repair requests from our buyer. We made a fair offer on the Good Memories house, but have no particular confidence that the owner is ready for the kind of reality check that would mean taking our reasonable offer. I’m sure something will work out (Renata clutches at optimism), but at this point we’re certainly curious about just how that will look. The boxes, oh the boxes! We had to clear out much of the basement for yesterday’s home inspection. The buyer’s agent at least sent us a warm message of appreciation after the fact, which helped us feel better about all the work. (Full disclosure: by “we” I mean my husband and my mother. I think I mostly ran around like a crazy chicken picking up and dropping off children, nursing a baby, and looking at houses while they cleaned out the basement.) The main level of our home now looks like the basement threw up all over it. The inspection reportedly went fine; if they decide to request minor repairs we expect to hear about it Monday. Housing inspection tomorrow; the buyer needs everything moved away from the walls in the basement. That’s rough, because our basement is crammed full of stuff. Crafty supplies can unfortunately take up a lot of room, and we’ve been hanging on to miscellaneous stuff that we intend to put in our next (bigger) house, and it’s all been stashed in the basement. 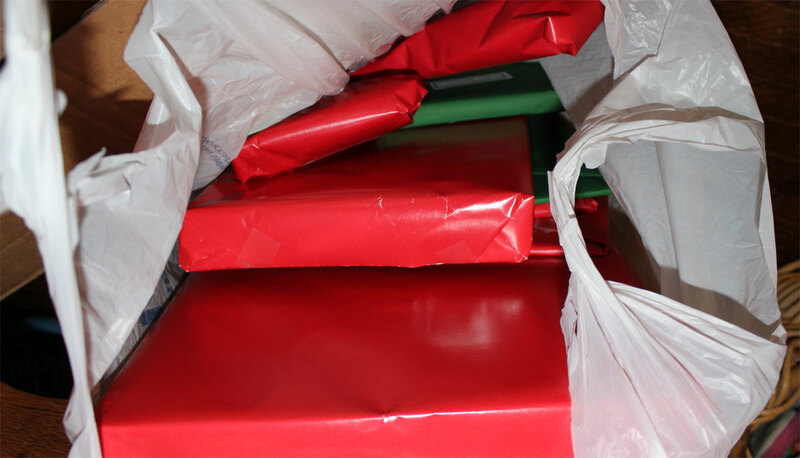 In the midst of all the basement chaos I am intent on acquiring and wrapping Christmas gifts. While it seems like one of the less pressing things we’ve got going right now, it is near the top of my mind. Santa must be able to find us, wherever we are! I typically do my shopping gradually, and I’d ordered a number of things just in the last week or so since it started looking like we’d be moving, so now most of our Christmas things are simply and hastily wrapped and sent off to Nana’s to hide in a closet until we need them. Having at least one thing under control makes me feel a little better. Dorothy and I also made spice cake (we skipped the pecans) from this month’s Cooking Light to celebrate selling the house. 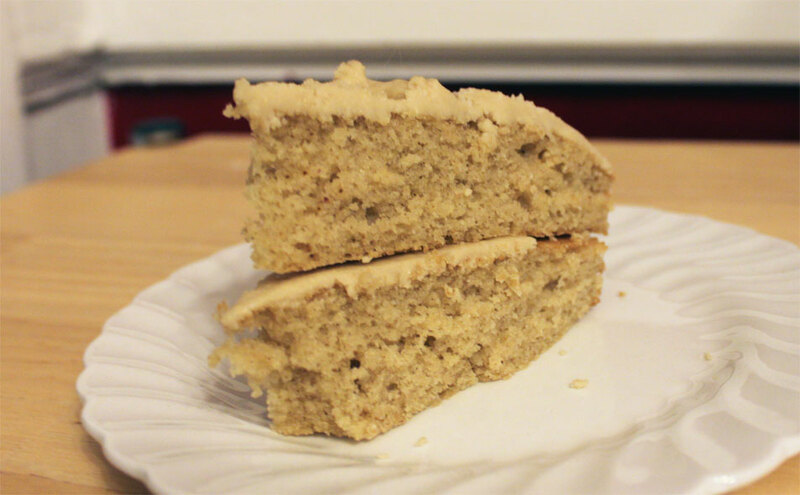 I guess I overcooked the maple part of the icing a bit because it hardened too quickly and is more like fudge, but it still tastes good. It was nice to take the time for a mother/daughter project in the midst of all this housing hustle. And speaking of the housing hustle, we still don’t know where we’re going. I’m starting to, ahem, sort of lose my s#!$ about it, and I’m tired of waiting to know where my family is going to be sleeping next month. The short version of the story is that we made a verbal offer on a house that is not for sale. It is none of the ones I described in my last post. As you might imagine, there is slightly more to the story than that, but I don’t feel like detailing in the blog. I don’t want to live in the knives and lizards house (besides, did I mention the kitchen there? Bleah! ), the good memories house is overpriced, and the dilapidated charmer is really just too dilapidated. We’ve been waiting since Monday afternoon to hear back, and at this point I’m jumping every time the phone rings. I need to go back and read my own post about not wishing my life away! But housing is a basic need, and even though I realize and am thankful that we are not actually faced with homelessness, with every box I pack in the basement I get more anxious about not knowing where these will be unpacked. Please send me good housing vibes! So we saw one more house today and will see two tomorrow. For your amusement (and as an exercise in working out my own feelings about them) I’ll describe our strongest options. The bad karma house is practically right around the corner from our current home. It’s a very attractive home on a pretty street. I like the way there is a good play space for the kids right next to a good sewing space for me. It’s a totally respectable and nicely maintained home that is probably the “smartest” purchase on our list. Your mother would approve. But why the bad karma? I don’t know if you’d call it karma or “vibes” or what, but even though I’m not a superstitious person I still feel like I need to have a positive feeling about the home I buy. If I am going to lay my head down in it every night, I want to feel some positive association with the space itself. When we walked up to this home and Rob was inspecting the exterior he found (this is no joke) a butcher knife in the immaculately well-kept front bushes. A butcher knife in the landscaping. Was it left over from Halloween? Was it being used as a hedge-trimming tool? I have no idea. Strange, but we went inside anyway, toured the upstairs and the main floor, noted the acceptable floorplan, etc., then headed down to the basement where there was a small neighborhood lizard writhing miserably in the middle of the floor. In our very path through the basement, there was a lizard dying. I think it actually died while we were down there. So on a tour of this otherwise totally respectable home we a) found a butcher knife in the hedges and b) witnessed the death of a small reptile. I don’t need to be a voodoo practitioner to feel like maybe that is just not the house for us, right? Plus, in such a respectable home, could I ever feel comfortable rocking out to classic outlaw country with my family while we cooked and I drank gin? It just didn’t have any grit to it at all. This is a house we’ve had our eye on since we put our own on the market. A young couple built it in 1940, raised their family in it, and lived in it until their own deaths, the most recent of which was five years ago. It was well-maintained and has a sunny, cheerful feeling. It’s also got the worst 1970s wallpaper you’ve ever seen. In every single room. Crazy floral patterns in every room, all in shades of yellow and gold except the kitchen where there is (drum roll please) a wallpaper mural of a wharf scene. Still, you know me, I like vintage things and I really love the floorplan of this house. I can totally picture the happy hum of home life my family would have under this roof. I also love the idea of taking up the banner of life in a house that grew old with one loving family. So the problem (besides the damage to my fingernails that a full year of peeling off wallpaper would cause) is that the daughter who grew up in this home and now owns it is completely delusional about what the home is “worth.” She loved it, she grew up in it, she watched her parents take good care of it, and now she’s asking a completely nutty amount of money for it. So it has sat empty, lonely, cold and unkempt for three years while no one buys it. Someone has cut the grass but not much else. A shutter has come loose, and who knows what has happened to the pipes. I guess we could make a low offer on the house, one that is more in keeping with what the actual real estate market says the home is worth, but we don’t have much confidence she’d take it. Then we’d have wasted precious time making an offer that has almost no hope of being accepted. That would leave us in an even bigger hurry to find a house and kind of sad, too, because when you actually make an offer you can’t help but to get a little emotionally involved. So the knives and lizards house would be a smart buy, the dilapidated charmer would be stupid. Who buys a house they know will be a money pit? Shouldn’t transactions like real estate be made with the head more than the heart? So we’ll take our final looks at our options tomorrow and then figure something out. A home inspection might shed light on our charmer, and maybe a serious offer would sway our Happy Memories owner more than we think. It might be a nice middle ground? In the meantime, I’m off to pour myself another margarita.